I'm trying to eat better. I've never been a "bad eater" - I can count the times on one hand that I've had soda, I can't stand most fast food - but I do tend to cook with a lot of oil and a lot of carbs(mmm, carbs). Last week, I wanted breaded chicken and cole slaw, but I didn't want to undo all of the hard work I've put into eating better. So, I thought about it for a while, and then remembered something I saw on a Jamie Oliver cooking show a few months back. He made a lovely coleslaw with a Greek yogurt-based dressing instead of mayonnaise. 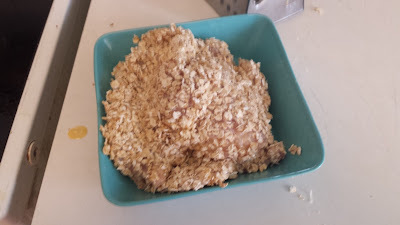 I then remembered something I'd read onliine ages ago, about using rolled oats instead of bread crumbs for oven baking meats and vegetables. Since I'd never actually done any of this before, I was a little nervous. 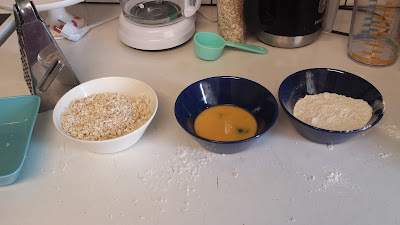 In three separate bowls, add flour, then egg, then oats. Add salt and pepper to all three bowls, but add Parmesan to only the oat bowl. Dredge the chicken through the flour, then egg, then oats. Add the chicken to a pan coated in olive oil over high heat, and cook on each side until brown and cooked through. 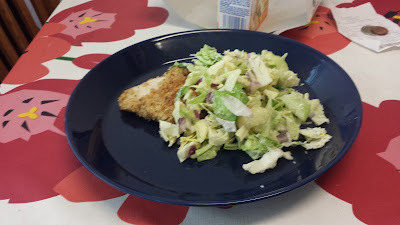 In a salad bowl combine chopped cabbage, onion, yogurt, mustard, salt, and pepper, and stir well. Serve with the chicken. I really enjoyed this recipe. The oats gave a really great flavor, and they're much healthier and much more widely available in Finland than bread crumbs. Even the smallest of shops will have rolled oats("kaurahiutaleet" in Finnish) in stock. This is a great recipe that I'm most likely going to make myself, thanks for sharing! Is the mustard noticeable in the slaw? That's my only concern, because I'm not a huge mustard fan. If it's masked I'm good, but if the taste stands out I may find an alternative. Rachel - if you'd like to use a weaker mustard, or leave it out, I think it would work. The flavors would just be a bit different.